New York Folklore’s inaugural Folk Art Gallery exhibition will showcase the work of Hatice Erbas-Sorkunlu. 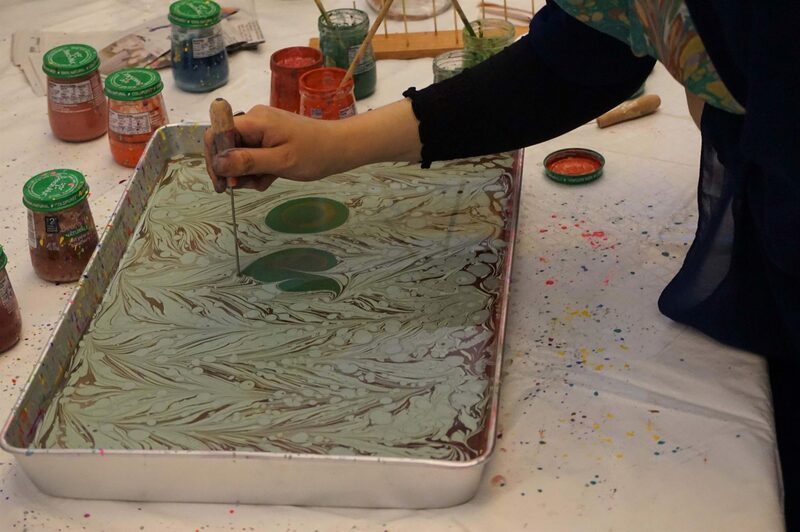 Ebru (Turkish paper marbling) is a traditional art where paint is floated in a tray of water and different tools and techniques are used to make unique designs on the surface, before being transferred to paper. Ebru is believed to have been invented in thirteenth century Turkistan. This decorative art then spread to China, India and Persia and Anatolia. Seljuk and Ottoman calligraphers and artists used marbling to decorate books, imperial decrees, official correspondence and documents. New forms and techniques were perfected in the process and Turkey remained the center of marbling for many centuries. The Exhibition and programming are supported with public funds from the Schenectady County Initiative Program and the Folk Arts Program of the New York State Council on the Arts, with the support of Governor Andrew M. Cuomo and the New York State Legislature. Support for the New York Folk Art Gallery provided by the William Gundry Broughton Charitable Foundation. In 2011, Hurricane Irene and Tropical Storm Lee delivered two consecutive blows to communities in the Schoharie and Mohawk Watershed, as torrential rains caused unprecedented flooding throughout the region. Five years later, in 2016, NYF Executive Director, Ellen McHale, began to record the personal experience narratives of flood survivors and volunteers: first through a series of community “sharing” sessions focused upon the volunteer experience and later through recording the personal experience stories of those whose lives and property had been directly impacted by the catastrophic flooding caused by Irene and Lee in the Mohawk and Schoharie Watersheds. This exhibition is one result of this documentation. It represents a partnership with Long Island Traditions with support from the National Endowment for the Arts.